I can't believe the Color Throwdown challenge is 12 weeks old already! This week's colors are Real Red, Old Olive, and Kraft and I love 'em!! Don't you just love Kraft paper? It's such a wonderful neutral, IMO. This card started with a Kraft base. I was really short on time (when am I not!!??) so I grabbed this Inkadinkado stamp that I've been wanting to use and stamped it in Real Red on Kraft paper. I then matted it with Real Red and Old Olive card stock and mounted it on the base with dimensionals. But before I did that, I tied a 1" red and kraft gingham ribbon around the card base. Then I added green Dew Drops to finish it off. Another easy card that will also be good to mass produce. I like it and I hope you do too. Thanks for visiting! 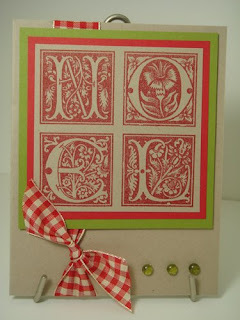 Recipe: Stamps--Noel (Inkadinkado); Paper--Real Red, Old Olive, and Kraft (SU! ); Ink--Real Red (SU! ); Accessories--ribbon (craft store), Dew Drops. This is the final week of the Jacksonbelle Inkadinkado contest. I've so enjoyed playing along with it--it's been great fun! I started this card with a Chocolate Chip base. The focal image was stamped on Very Vanilla card stock with Basic Brown ink and was sponged with Ranger Distress ink in Antique Linen. Then it was layered on Old Olive card stock. I cut a piece of DP from American Crafts line called Pumpkin Pie with my new petite oval Nestabilities die. I then paper pierced around it after it was layered on More Mustard card stock that had also been distressed with the same ink. I added some orange, green, and copper brads and mounted the focal image up on dimensionals. It was an easy card and will be a good one to mass produce. Thanks for looking! Recipe: Stamps--Inkadinkado Thanksgiving; Paper--Very Vanilla, More Mustard, Chocolate Chip, Old Olive (SU! 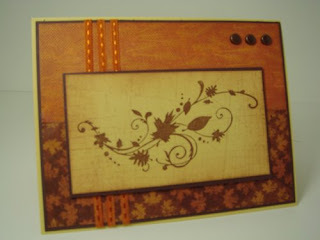 ), American Crafts Pumpkin Pie DP; Ink--Basic Brown (SU! ), Ranger Distress ink in Antique Linen; Accessories--Cuttlebug, 1/16" hole punch, Petite Oval Nestabilities die, brads (craft store), paper piecer and mat. I love this paper and this little stamp, don't you? So, I sat down to make a card with them and this is what I came up with--it just sorta evolved into what you see here and I love it! The DP is by Heidi Grace and is called, appropriately, Candy Corn. It's from the Jeepers Creepers line of Shimmer Glitter paper and it does both very nicely. 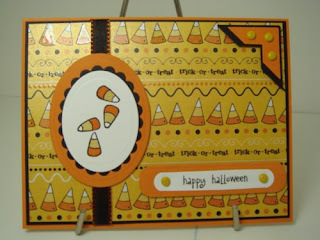 The Candy Corn stamp is from Impression Obsession, as is the sentiment. The words are from a sheet of words and I don't have the name of it at hand--I'll look and add it later. I started by stamping the candy corn on Whisper White card stock with Basic Black ink, and colored it with Pumpkin Pie and So Saffron markers. After cutting/embossing with my small oval Nestabilities die, it was layered on a piece of Basic Black card stock, cut/embossed with a small scalloped oval die, and then on a layer of Pumpkin Pie card stock, also cut/embossed with a small oval die, and is up on dimensionals. The DP was put on a layer of Basic Black with a double sided satin ribbon in black and orange wrapped around, and is on a card base of Pumpkin Pie. The double photo corner is accented with brads and is up on dimensionals. 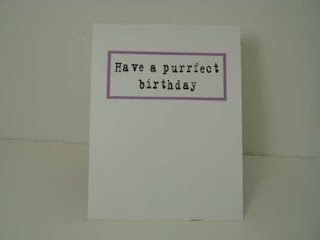 The sentiment was stamped with Basic Black on Whisper white card stock and the ends rounded with the word window punch. It was then layered on a piece of Pumpkin Pie cardstock cut/embossed with a Nestabilities die. It's also accented with brads and is up on dimentionals. Thanks for visiting and looking. Have a great day! Recipe: Stamps--Candy Corn and sentiment (Impression Obsession); Paper--Whisper White, Basic Black, Pumpkin Pie (SU! ); Ink--Basic Black and Pumpkin Pie and So Saffron markers (SU! ); Accessories--Word Window punch, Photo Corner punch, small oval and small scalloped oval Nestabilities, Cuttlebug, ribbon and brads (craft shop). Thinking of you from the garden. On September 22, 2007, a very dear friend of ours passed away after a long illness. This card is for his wife, also a dear friend, on the anniversary of his passing. I hope it will bring her a tiny bit of comfort. I wanted soft, soothing images on this card and this one fits the bill perfectly. It's From the Garden, a hostess gift from the Spring and Summer catalog. I love it's simplicity and elegance. I started with a Blush Blossom card base and stamped the image in Blush Blossom on Whisper White card stock after using the scallop punch on the bottom edge. I tied a bow with some blush colored sheer ribbon around the stamped layer, stamped the sentiment in Creamy Caramel, and added flat back pearls for balance. Unlike most cards I make, I knew exactly what I was going to do before I sat down to make it. And it came together and turned out exactly like I pictured it would. I love it. Thanks for visiting! Recipe: Stamps--From the Garden and Sincere Salutations (SU! ); Paper--Whisper White and Blush Blossom (SU! ); Ink--Blush Blossom and Creamy Caramel (SU! ); Accessories--ribbon and flat back pearls (craft store). I was just playing around and made this simple little Halloween card. I need several cards to send to an online group and this will be one of them. It was quick to make and if time gets short, I'll make them all like this one. 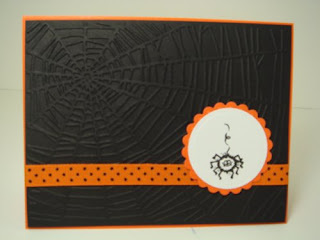 I started with craft store orange card stock and added a Basic Black layer that I'd run through my Cuttlebug with the new Spider Web folder. Then I stamped this cute little spider that I picked up on the sale rack at Hobby Lobby on Whisper White. I cut/embossed that image with a small circle Nestabilities die. I cut an orange mat with a small scalloped Nestabilities die and layered the spider image on it. I ran a piece of craft store orange and black polka-dotted ribbon under the focal image, which was popped up on foam tape. Easy peasy and it's done! Recipe: Stamps--Willnway Halloween; Paper--Whisper White and Basic Black (SU! ), orange (craft store); Ink--Basic Black (SU! ); Accessories--Cuttlebug and Spider Web folder, small circle and small scalloped Nestabilites dies, ribbon (craft store). I'm loving making fall cards. Did I mention that fall was my favorite time of the year, other than Christmas? I can't believe this is week #3 of the Jacksonbelle contest! This card uses one of the images from the new fall leaves Inkadinkado set. The card base is So Saffron and the next layer is Chocolate Chip. Two designs from the K & Co. Fall Harvest paper pack are layered next. Then I added 3 pieces of narrow rust ribbon and 3 antique copper brads. The focal image paper was first stamped with the Sanded backgrounder and Versafine Vintage Sepia ink, stamped off twice. The main image also uses Versafine Vintage Sepia ink. That was matted on Chocolate Chip card stock and it's done. I love it and I hope you do, too. Thanks for looking! Recipe: Stamps--Sanded backgrounder (SU! ), Inkadinkado fall leaves; Paper--so Saffron and Chocolate Chip (SU! ), K & Co. Fall Harvest mat pack; Ink--Versafine Vintage Sepia; Accessories--ribbon, brads (craft store). I've had this stamp for a while and decided to pull it out for a get well card. I also pulled out some DP I've had for a while and wanted to use. The card base is Very Vanilla card stock and the DP colors match Riding Hood Red, Certainly Celery, and Barely Banana really well. I really love Riding Hood Red--it's a gorgeous red that I'm sure I'll be using a lot. It's a simple card with just layers of paper and card stock, but I like it. The sentiment is from Kitchen Sink's Never a Loss 4 Words set and is stamped on the flower stems. 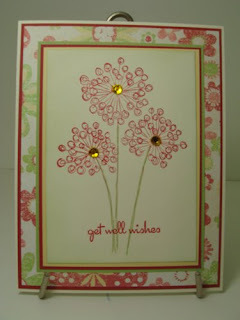 For a little bling, I added some gold rhinestone accents to the centers of the flowers, which were stamped on Very Vanilla card stock and sponged with Certainly Celery ink (I'm having trouble NOT sponging edges any more, LOL). Since this card is going out of the country, I didn't use dimensionals on the focal image like I probably would otherwise. Recipe: Stamps--Constellations (Penny Black), Never a Loss 4 Words (Kitchen Sink Stamps); Paper--Very Vanilla, Certainly Celery, Barely Banana, and Riding Hood Red (SU! ), DP (Hobby Lobby); Ink--Certainly Celery, Barely Banana, and Riding Hood Red (SU! ); Accessories--gold rhinestones (Michaels). The Color Throwdown challenge colors for week # 11 are: Old Olive, Chocolate Chip, and Baja Breeze. At first I thought, what can I do with these, LOL!? Then I started going through my stamps and found an Inkadinkado hydrangea stamp that would be perfect! I started by stamping the image in Chocolate Chip on Whisper White card stock. I was going to leave it like that but then I decided to put a wash of color on it. *IF* I'd thought ahead, I'd have used watercolor paper and waterproof ink, but as it turned out, it's OK. I used my reinkers, water, and a brush for the color wash--Old Olive for the leaves and Baja Breeze for the flower head and I added a little bling with a Sakura glitter pen. Then I sponged the edges with Chocolate Chip and mounted it on Chocolate Chip card stock and is up on pieces of foam tape. The card base is Baja Breeze and the Old Olive element is layered on Chocolate Chip, to tie it all together. A brown ribbon was tied around this element and brown brads balance the layout at the top. The sentiment is from the Essence of Love set. I'm liking this card and the colors, now that I figured out a way to make them work. 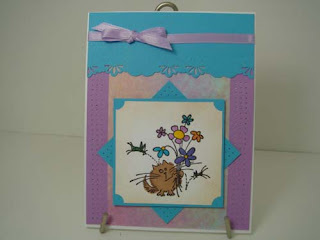 I'm also liking this hydrangea stamp and can see using it in different colors in the future. Thanks for visiting and looking at my cards. Recipe: Stamps--hydrangea (Inkadinkado), Essence of Love (SU! ); Paper--Whisper White, Old Olive, Chocolate Chip, Baja Breeze (SU! ); Ink--Old Olive, Chocolate Chip, Baja Breeze (SU! ); Accessories--ribbon, brads, foam tape (craft store). When I found I needed a sympathy card, I immediately thought of Elegant Eggplant. Time was in short supply so this card is very simple, but I like the way it turned out. The card base is Elegant Eggplant. You can't see it in this picture, but I scored two lines, 1/4" apart, between the sentiment and the bottom of the card with my ScorPal, and they really add to the card. The focal image is stamped in Elegant Eggplant on Very Vanilla card stock with the Posies background stamp and layered on Very Vanilla. 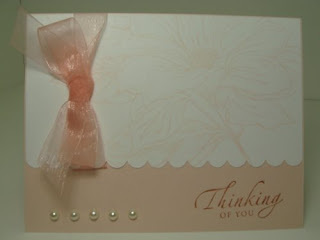 Vanilla sheer ribbon is tied around this before it was attached to the card base. The sentiment is from the Kitchen Sink set Never a Loss 4 Words, stamped on Very Vanilla with Elegant Eggplant and punched out with the Word Window punch. That's it--clean and simple, but a little elegant, I think. As always, thanks for visiting and feel free to leave a comment! Recipe: Stamps--Posies backgrounder (SU! ), Never a Loss 4 Words (Kitchen Sink); Paper--Elegant Eggplant, Very Vanilla (SU! ), Ink--Elegant Eggplant (SU! ); Accessories--vanilla sheer ribbon (craft store), Word Window punch (SU! ), ScorPal. I need a card for our good friend, Laura's, birthday. While looking for layout ideas, I ran across this one at Poetic Artistry. It's a Mojo Monday sketch challenge--# 28. I thought this paper from Papertrey Ink's Everyday Blessings line would work well and I really like how it turned out, especially after sponging the edges of it (and the main image) with Baja Breeze ink. I'm also using Creative Memories Caribbean Blue card stock as it matches the DP really well. The sugared brads and ribbon are a perfect match, as well, and Baja Breeze and Kiwi Kiss ink are very close. Thanks to Julee for a great sketch--I think I'll be using this again. And thanks for visiting--I hope you like this card as much as I do. Recipe: Stamps--Spiral Bouquet (Papertrey Ink); Paper--Whisper White (Stampin' Up! 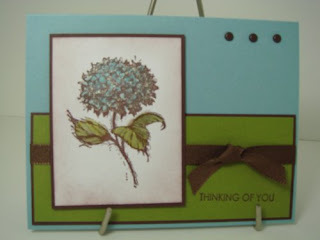 ), Caribbean Blue (Creative Memories), Everyday Blessings DP (Papertrey Ink); Ink--Kiwi Kiss and Baja Breeze (Stampin' Up! ); Accessories--Cuttlebug, Small oval and small scalloped oval Nestabilities (Spellbinder), sugared brads (Hobby Lobby), 1" grosgrain ribbon (JoAnn Fabrics). That's the name of the tree this ornament is going on. 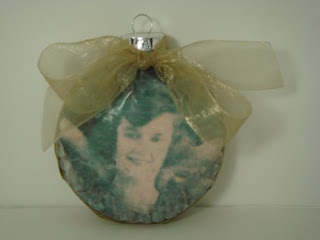 I did twelve like this, with pictures of our ancestors decoupaged on them in the same manner as the music and Santa ornaments. I used gold tissue paper for these, and added gold sheer ribbon bows. This card is for the Jacksonbelle contest week 2. 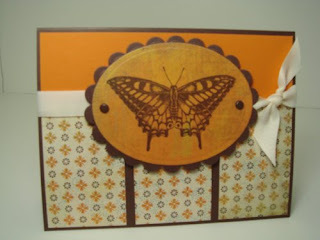 The butterfly is an Inkadinkado stamp that I stamped on paper from the Basic Gray Mellow collection in StazOn Timber Brown. The image was cut out with a oval Nestabilities die and matted on Chocolate Chip card stock that was cut with a Nestabilities scalloped oval die. Brown brads accent the focal image. The base is Chocolate Chip card stock with an element of Pumpkin Pie and three elements of more paper from the Mellow collection. A piece of off-white twill separates the upper and lower elements. Recipe: Stamps--butterfly by Inkadinkado; Paper--Chocolate Chip, Pumpkin Pie card stock (SU! ), Mellow 6 x 6 pad (Basic Gray); Ink--Timber Brown (StazOn); Accessories--brads (craft store), twill (Wal*Mart). The Color Throwdown Challenge #10 is using Red, White, and Blue in honor of 9/11. I'm using a retired SU! stamp named God Bless America. I stamped it in Real Red and Brilliant Blue and double matted it with the same colors, on Whisper White card stock. The sentiment is stamped in Brilliant Blue and the red, white and blue ribbon accents the focal image. Three silver stick-on brads add balance. 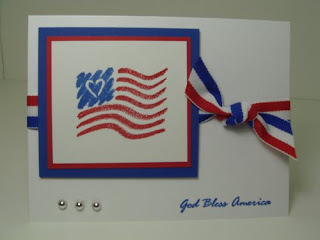 Recipe: Stamps--God Bless America (SU! ); Paper--Whisper White, Real Red, and Brilliant Blue (SU! ); Ink--Read Red and Brilliant Blue (SU! ); Accessories--flat back brads and ribbon (craft store). I needed another masculine birthday card and the new Prestwick DP came immediately to mind. 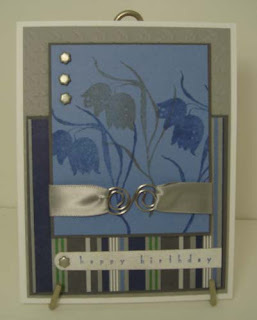 I CASEd a card by Cindy at The Creative Closet for this card. I kept her layout and used one of the same stamps--just changed the colors and hardware. I started with a Whisper White card base, added a Going Gray layer that I'd run through my Cuttlebug (I love this thing!!!!) with a new folder, Houndstooth. Then I added the secondary element of Prestwick DP layered on Basic Gray card stock. I stamped the sentiment on Whisper White in Brocade Blue and sponged the edges with Going Gray, rounding one end with a Word Window punch. I attached it to the secondary element with a brushed silver flower brad. The focal element was stamped with the Checkered Lily image from Flourishes' Spring Ephemerals set in Going Gray and Brocade Blue, then layered on Basic Gray card stock. More brushed silver flower brads were added the this element. Light gray double sided satin ribbon was attached with silver hardware. I like it! Thanks for visiting and feel free to leave a comment! Recipe: Stamps--All Holidays (SU! ), Spring Ephemerals (Flourishes); Paper--Whisper White, Brocade Blue, Basic Gray, Going Gray, Prestwick DP (SU! ); Ink--Brocade Blue and Going Gray (SU! ); Accessories--silver hardware and brads (craft store), Cuttlebug and Houndstooth folder. I'd been wanting to use my new Fluffles stamp so I decided this was the time. I stamped Fluffles with Basic Black ink and colored him (her?) with Creamy Caramel SU! marker, and used a Garden Green marker on the grasshoppers. On the flowers I used Yo Yo Yellow, Tempting Turquoise, Pumpkin Pie, Bordering Blue and Orchid Opulence markers. Using Julee Tilman's Mojo Monday #51 sketch, I started with a Whisper White card base, then added a layer of Orchid Opulence which I paper pierced and then a layer of a craft store patterned paper. The next layer is Tempting Turquoise, the corners of which I paper pierced, as well. The main image, with it's corners punched with the ticket punch, is layered on Tempting Turquoise and is up on dimensionals. The top element is Tempting Turquoise and has been edged with a Fiskars embossing punch and embellished with orchid satin ribbon. 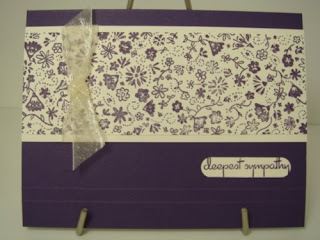 The sentiment on the inside was stamped with a Making Memories magnetic stamp set and layered on Orchid Opulence paper. This was a fun card to make. Thanks for looking, and feel free to leave a comment! Recipe: Stamps--Fluffles, Making Memories magnetic set alphabet; Paper--Whisper White, Orchid Opulence, Tempting Turquoise (SU!) and craft store patterned paper; Ink--Basic Black, Creamy Caramel, Garden Green, Yo Yo Yellow, Tempting Turquoise, Pumpkin Pie, Bordering Blue and Orchid Opulence markers (SU! ); Accessories--orchid satin ribbon (craft store), paper piecer and mat. I also got my Santa ornaments done this past weekend. I printed off some vintage Santa pictures, cut them out with my petite scalloped circle Nestabilities and aged them with Ranger Distress Ink in Tea Stain. 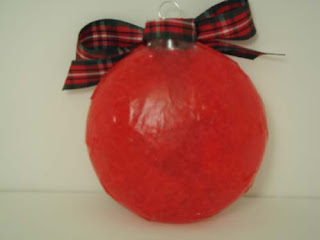 Then I used torn strips of red tissue paper to cover the clear glass balls (same type as I used on the music ornaments) and decoupaged it in the same manner as the music ornaments. You need thinnish paper to do this with and the tissue paper went on perfectly. It gives a translucent, vintage look to the ornament that you can see in the second picture and that I like. 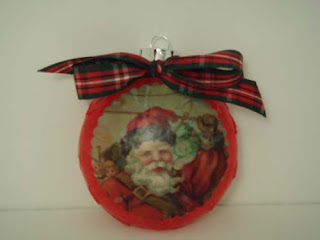 Then I decoupaged the Santa picture on top of the tissue paper, after snipping the edges several times to help it lie flat. A red plaid bow and it's done! Working on Christmas ornaments again this past weekend and here are the ornaments for the music tree. 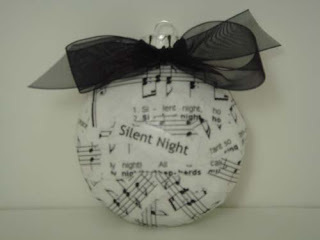 I printed Christmas sheet music that I found online and tore (well, actually started tearing it but ended up using deckle-edged scissors) it up and decoupaged the strips onto clear glass balls using Modge Podge. These balls are not round, but flattened out, but I still had to snip the edges to make them lie flat. One-inch black sheer ribbon tied around the top finished them off. ...I wanted to send a friend some hugs. And, because I wanted to do the Color Throwdown challenge #9. And because I wanted to do the Jacksonbelle Embellishments Week 1 layout challenge. The colors this week are Kiwi Kiss, Baja Blue, and Regal Rose. The Jacksonbelle challenge can be found here. You have to use Inkadinkado stamps for this challenge. 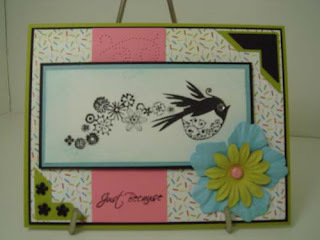 I started with a Kiwi Kiss card base, layered it with Basic Black and then a layer from Basic Grey's Cupcake designer paper 6 x 6 pad. I added some corner punch elements, one embellished with black flower brads. The secondary element is Regal Rose on which the sentiment from the Flourishes Siberian Iris set is stamped. I also used a section from an Ornare paper piercing template. The main image, from Inkadinkado's Bird's Galore set, is stamped on Whisper White, layered first on Baja Breeze and then on Basic Black and is up on dimemsionals. The white layer edges are sponged with Baja Breeze and the bird's eye has a rhinestone accent. 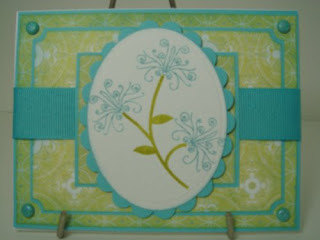 I added Prima flowers in blue and green with a sugared pink brad, all of which match the challenge colors. This one was indeed a challenge, but I like the end result. Thanks for stopping by. Recipe: Stamps--Inkadinkado Birds Galore and Flourishes Siberian Iris; Paper--Whisper White, Basic Black, Kiwi Kiss, Baja Breeze, and Regal Rose (all SU!) and Basic Grey Cupcake DP 6 x 6 pad; Ink--Basic Black (SU! ); Accessories--Corner punch, Ornare paper piercing template, brads and rhinestones (craft store) and Prima flowers.